Caregiving is in Easterseals' DNA — it's at the heart of everything we do. This is especially true in our services and supports for military veterans and their families. 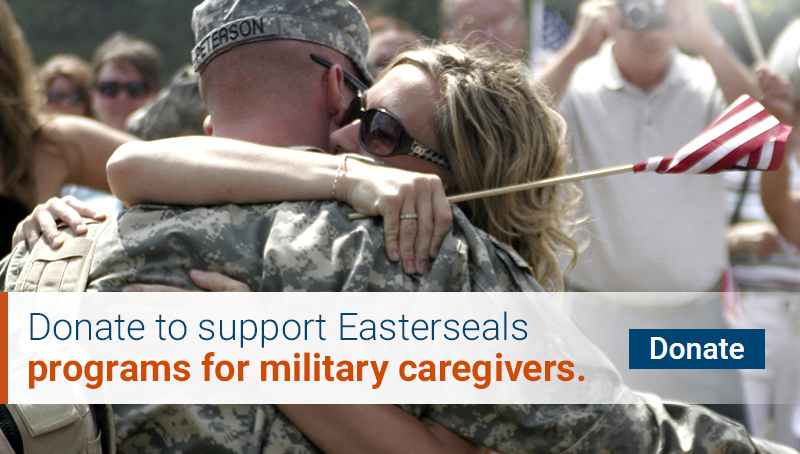 Our national network supports military caregivers across the lifespan. From training to respite services, Easterseals makes a profound, positive and life-changing difference in people's lives every day. Military caregiver tobacco cessation tool kit. We've partnered with the CVS Health Foundation and the American Lung Association to offer these great new resources. Also listen to our online Living Tobacco Free presentation for military & veteran caregivers. Military Caregiver Training: Through a contract with the Department of Veteran Affairs (VA) from 2011-2017, Easterseals administered an in-person, online and self-study workbook training caregivers in collaboration with Atlas Research, Family Caregiver Alliance, National Alliance for Caregiving and National Alliance for Hispanic Health. More than 38,000 caregivers benefitted from these sessions with over 4,000 attending in-person self-care courses. Learn more about the VA Caregiver Support program. Center-based Adult Day Services or in-home services: Easterseals is the premier provider of center-based adult day programs. These are available for caregivers of older veterans with physical and/or cognitive concerns. Learn more. Respite care: We offer a variety of respite options for military families. Examples include those families who have members with special needs through local partnerships with Childcare Aware of America as part of the US Navy and US Air Force Exceptional Family Member Program. Easterseals also partners with ARCH National Respite to as part of the Elizabeth Dole Foundation. We also partner with the University of Maryland's Legacy Corps program that provides in-home respite for service members/veterans and their families at locations across the U.S.
Watch: Easter Seals caregiver, Andrea Simone and Dole Fellow, Betty Easly, join Hallmark "Home and Family"